Olympic gold medalist, Sarah Hughes, was born on May 2, 1985 in Great Neck, New York. Hughes is a U.S. figure skater. She is best known for winning the 2002 Olympic gold medal in figure skating. Sarah Hughes is the fourth of six children. One of her younger sisters, Emily, is also a figure skater and competed at the 2006 Winter Olympics. 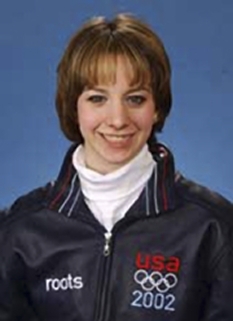 Sarah Hughes began skating at the age of three under the direction of Patti Johnson who coached her until Hughes competed at the World Junior Figure Skating Championships. Hughes won the Junior title at the 1998 United States Figure Skating Championships in the 1997–1998 season. The following season, she competed on the ISU Junior Grand Prix, winning the silver medal at the 1998–1999 Junior Grand Prix Final and at the 1999 World Junior Figure Skating Championships. At the 1999 U.S. Figure Skating Championships, which were held after the World Junior Championships, Hughes won the pewter medal. It was her senior-level debut. The U.S. had three spots to the 1999 World Figure Skating Championships, and Hughes, by placing fourth at Nationals, would not normally have qualified for the team. However, Naomi Nari Nam, the silver medalist, was not age-eligible to compete at Worlds. Hughes was also not age-eligible for the senior World Championships. 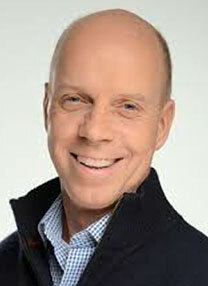 However, Hughes had won the silver medal at the 1999 World Junior Championships, held in November 1998, and so was allowed by ISU rules to compete at the 1999 World Championships. She finished 7th at those World Championships. In the 1999–2000 season, Hughes made her Grand Prix debut, winning the bronze medal at the 1999 Trophee Lalique. 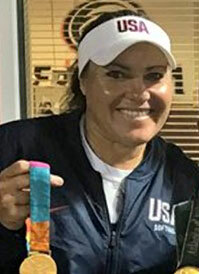 She won the bronze medal at the 2000 U.S. Figure Skating Championships and placed 5th at the 2000 World Figure Skating Championships. In the 2000–2001 season, she won three medals on the Grand Prix circuit and won the bronze medal at the 2000–2001 Grand Prix of Figure Skating Final. She won the silver medal at the 2001 U.S. Figure Skating Championships. At the 2001 World Figure Skating Championships, she won the bronze medal. In the 2001–2002 season, Hughes competed again on the Grand Prix, winning the 2001 Skate Canada International and placing second at her other two events. She won her second consecutive bronze medal at the Grand Prix Final and then won the bronze medal at the 2002 U.S. Figure Skating Championships to qualify for the 2002 Winter Olympics. At the 2002 Olympics, Hughes placed fourth in the short program. In her long program, she landed seven triple jumps, including two triple-triple combinations. She won the long program, and as the three contenders ahead of her after the short program all made mistakes in their respective long programs, Sarah jumped from fourth to first in the overall standings and won the event. Hughes met President George W. Bush on April 12, 2002. After her Olympic win, Hughes was honored with a parade in her hometown of Great Neck. Senator Hillary Rodham Clinton spoke at the event and declared it Sarah Hughes Day. 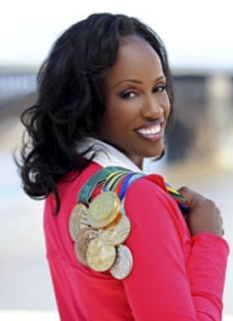 She received the James E. Sullivan Award as the top amateur athlete in the U.S.
Hughes did not compete at the 2002 World Figure Skating Championships. She stayed in for the 2002–2003 season. She won the silver medal at the 2003 U.S. Figure Skating Championships and placed sixth at the 2003 World Figure Skating Championships. In 2003, Sarah Hughes began her studies at Yale University. She took the 2004–2005 year off from college to skate professionally with the Smuckers Stars on Ice tour company. She was inducted into the International Jewish Sports Hall of Fame in 2005. DISCLAIMER: PFP Sports Talent Agency does not claim to represent itself as the exclusive agent for Sarah Hughes. PFP Sports Talent Agency is a booking agency that represents organizations seeking to hire pro athletes and sports personalities such as Sarah Hughes for speaking engagements, personal appearances, product endorsements and corporate entertainment. Fees on this website are estimates and are intended only as a guideline. Exact fees are determined by a number of factors, including the location of event, the talent’s schedule, requested duties and supply and demand. PFP Sports Talent Agency makes no guarantees to the accuracy of information found on this website and does not warrant that any information or representations contained on this website will be accurate or free from errors. We are often asked how can I find out who is Sarah Hughes's agent? To find Sarah Hughes appearance fees and booking agent details, you can contact the agent, representative or manager through PFP Sports Talent Agency for speaking fee costs and availability. PFP Sports Talent Agency can help your company choose the ideal sports personality for your next marketing campaign. To hire Sarah Hughes for an appearance, speaking event or endorsement, contact Sarah Hughes's booking agent for more information.